With its best-in-class sensitivity, the F-2700 is an ideal choice for a wide range of applications from teaching to biotech and material research. 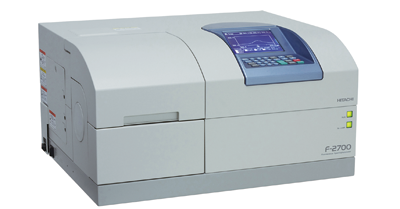 The Hitachi F-2700 Fluorescence Spectrophotometer is available in two configurations depending on your laboratory’s needs: stand-alone andPC-controlled. As a stand-alone unit using the built-in keyboard and LCD screen, it is ideal for teaching and routine measurements. Adding PC control expands its capabilities to biotech research and quantum yield applications.